What Is Bergamot Mint Essential Oil? No doubt you have heard of bergamot essential oil and you will all be familiar with mint but how many people know about bergamot mint essential oil and how much good it can do for your body and your mind. People who regularly use bergamot mint essential oil describe it as delightful. That is why this oil is popular and trending among aromatherapists. The composition of the oil is fairly similar to lavender essential oil and is synergistically compatible with this oil. The essential oil is known for its relaxing, calming effects and its ability to uplift the spirits. You might say that bergamot mint oil closely resembles an oil that is a blend of lavender, mint, and citrus. 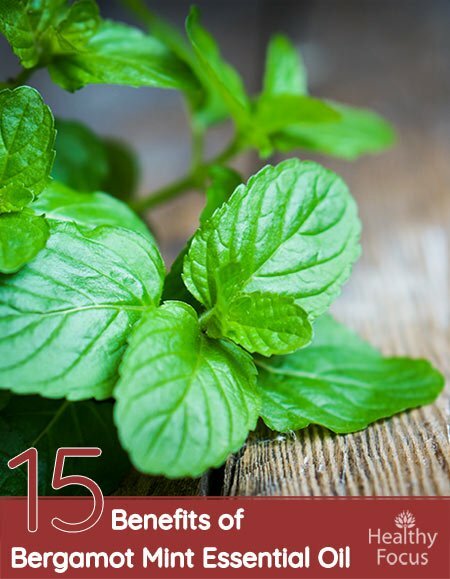 The oil possesses less of a minty aroma than peppermint essential oil. It conveys more of a citrus scent and is often referred to as lemon mint oil. The botanical name for the oil is Mentha citrata or Mentha aquatic L. var. citrata. The oil is steam distilled from the leaves of the plant. The oil’s color is clear and its consistency is thin. The aroma of the oil is considered medium to strong in intensity. This oil has been recommended for relieving respiratory distress, congestion, digestive disturbances, nausea, and sore muscles. The oil is used in the fragrance industry for product applications. The two main constituents, linalyl acetate and linalool, are known for their healing effects for a number of conditions. For example, linalyl acetate is known to provide pain relief and anti-inflammatory properties. It is also known as an antispasmodic and for its ability to promote the immune response. Linalool is considered an analgesic, antibacterial, and anti-fungal (candida) ingredient. You can also use the properties of linalool to combat inflammation, relax muscle spasms, and as a sedative. Similarly to linalyl acetate, it stimulates the immune response. Bergamot mint is also known by a number of other common names. these include lime mint, lemon mint, pineapple mint, orange mint, eau-de-cologne mint, wild water mint, water mint and su nanesi. Bergamot mint has a strong odor very similar to lavender. This is because its two major constituent, linallol and linalyl acetate make up about 90% of this oil. Bergamot mint grows predominantly is subtropical regions especially in northern india. In India, the oil is used mainly in the perfume industry. A tea is made from the plant’s fresh and dried leaves and is used for a range of medical issues. Bergamot mint tea has traditionally been used to treat digestive problems, nausea, stomach aches and parasites. It is also used to treat headaches, fevers and nerves. Pregnant women should not use the plant or the oil because in large doses, it can lead to miscarriage. Because bergamot mint essential oil promotes hormonal secretions, it helps maintain the correct metabolic rates. This type of stimulating influence increases the secretion of bile, digestive juices, and insulin. When this happens, digestion is easier and nutrients are more fully absorbed. In addition, blood sugar is lowered because of the assimilation and decomposition of glucose. According to research studies, this essential oil has the components needed to serve as a disinfectant and antibiotic. The oil has the ability to inhibit the growth of viruses, fungi, or germs. It can also stop infections, including those involving the skin. If you use the oil in soap and your bath water, you will feel healthier and your skin will appear smoother. The oil is recommended for curing and treating infections that are related to the intestines, colon, urinary tract, and kidneys. This essential oil encourages hormonal secretions which reduces nerve sensitivity. When this occurs, people experience fewer problems with pain. The oil is recommended for use in treating muscle aches, sprains, headaches, or other types of distress that require the use of analgesic medicines. People like to use the oil to avoid certain side effects from over-the-counter medicines. These side effects can have an adverse effect on the functioning of your kidneys or liver. Analgesics sold over the counter also thin the blood and can make it hard to sleep. The flavonoids in bergamot mint essential oil relax the body. They soothe nervous tension and reduce stress and anxiety levels. These types of feelings are often associated with high blood pressure, depression, or insomnia. When bergamot mint essential oil is used, it also increases the production of serotonin and dopamine, which can help you relax and sleep more easily. When bergamot mint oil is used, it promotes the secretions of bile, enzymes, and acids in the digestive tract. It also regulates the peristaltic activity of the intestines and speeds up digestion. People who suffer from constipation can benefit a great deal from this essential oil. Use of the oil regulates bowel movement and prevents a number of common digestive problems like indigestion, bloating and stomach upset. If you are looking to boost your digestive health and settle your stomach, this is one of the best essential oils you can choose. According to research, bergamot mint essential oil assists in keeping the skin looking its best. That is why the oil is used extensively in the cosmetics and skin care industry. It is added to creams, lotions, and soaps. The cicatrizant in the oil heals blemishes and possibly even scars. The oil also distributes the melanin in the skin so it appears more uniform and attractive.. The oil is often recommended to help get rid of scars left by acne. People seeking a refreshing, natural deodorant often choose bergamot mint essential oil. The pleasant aroma associated with the oil and its disinfectant properties kills the germs that lead to body odor. The citrusy smell can be used to eliminate other smells as well. That is why the oil is used commercially in room air fresheners and sprays. The oil is considered a febrifuge, or a substance that is used to lower the body temperature. This oil is recommended for this purpose for one of various reasons. It is an antibiotic and combats infections that result from bacteria, viruses, or protozoa, all of which can trigger a fever. The oil also stimulates the metabolism and hormonal secretions, which provides a warm feeling and produces the secretion of sweat. Toxicity is reduced when this oil is used. When the toxins are removed, the patient’s fever subsides and he or she begins to heal. Many women use this oil to help deal with the symptoms of menopause. Although there is no scientific evidence to evaluate its effectiveness, there is plenty of anecdotal evidence to suggest it helps with common symptoms such as night sweats and hot flashes. There is also evidence that this oil can help boost focus and ease stress suffered by many women during menopause. This oil is often chosen for taking care of problems with intestinal worms. Although intestinal worms are less of an issue in the developed world, they remain a major concern in developing nations where this oil represents a potential alternative to expensive medication. Bergamot oil is used as a mouthwash to treat teeth that are infected or as a mouthwash. It also is helpful in protecting the teeth against cavities. Try making a mouthwash by adding a few drops of your essential oil to a glass of water. Use the mixture as a mouthwash every morning and evening but be careful not to swallow any of it. As well as protecting your teeth and gums from infection, it can also help guard against embarrassing bad breath through the day. Bergamot mint oil is known to relax the muscles and nerves and provide relief from cramping or painful contractions involving the muscles. Respiratory spasms are also relieved, such as those produced by asthma. Dilute your bergamot mint essential oil with a suitable carrier oil and massage it into your aching muscles. Alternatively, add a few drops to your bath water, hop in and relax and let this soothing oil work its way into your muscles. Use the disinfectant qualities of bergamot mint essential oil to speed up the healing process. Not only do wounds heal faster but so do conditions such as ulcers, eczema, itching, or cracks in heels. The oil safeguards wounds from becoming septic. It also treats infections so that new ones do not develop. The oil is also used as an expectorant to loosen mucus and phlegm and helps the body eliminate the congestion through coughing or sneezing. You can use the oil as an anti-congestive in a diffuser and quickly eliminate problems such as coughing or colds. However, the best way to use the oil to treat a respiratory condition is to make your own steam treatment. Add a few drops of bergamot mint essential oil to a sink full of piping hot water. next cover your upper torso in a towel then lean over the sink and breathe in the vapors for a few minutes. Bergamot mint essential oil can be considered a type of tonic that is good for the respiratory system, the blood flow, and the digestive tract. It also relieves problems with the nerves and improves the looks of the skin and muscle tone. Bergamot mint essential oil can be inhaled to improve digestion, ease stress and combat nausea. You can inhale it directly from the bottle or via a diffuse machine. To treat colds and congestion, make a steam inhaler as per the directions earlier in the article. You can also apply the oil topically to your skin provided you dilute it first with a suitable carrier oil. Carriers oils that you can use with this oil include jojoba oil, coconut oil, or sweet almond oil. However, you should consult with an aromatherapist and your doctor before using the oil. While bergamot mint essential oil is used primarily for aromatherapy purposes, it can also be used as a massage oil or applied to the skin after showering. Doing so will soothe any problems with inflammation and promote the skin’s overall appearance. Some people turn the oil into an air freshener in their cars, homes, or offices. Other users include a drop of the oil in their teas to promote better digestion. Regardless of your use of the oil, always check with your doctor or an alternative health care specialist about the use of the oil for you. You should always delete the oil with a carrier oil to make it safe to use. You can also blend the oil with other oils to enjoy even more health advantages. No noted safety precautions are indicated for the use of this essential oil but that does not mean it is safe to use. You should always be careful when using this or any other essential oils.. Make sure that you check with your health care practitioner before you use the oil for a specific purpose. Before applying the oil topically, make sure that you dilute it with a suitable carrier oil such as coconut oil or sweet almond oil. Essential oils are very powerful and when applied ‘neat’, may cause an allergic reaction. Even after diluting the oil, it is good practice to perform a patch test on a discrete area of your skin before applying a larger dose. Do not take this essential oil internally. Pregnant women should avoid using this essential oil. Like many other members of the mentha family, it can result in miscarriage especially in higher doses. Breastfeeding women should also err on the side of caution and avoid using this oil. If in doubt, make sure that you speak to your doctor before using this or any other essential oil. Bergamot mint essential oil comes from a plant that is a cross between an orange and lemon tree. Its citrus scent is as enticing as its many health benefits. You can use the oil to relieve congestion, improve the looks of your skin, get rid of digestive disturbances, and make yourself feel calmer overall. As well as its anility to relieve such a range of physical conditions, bergamot mint essential oil is equally effective in fighting stress and insomnia. If you want to feel better overall, this is one essential oil that you need to include in your essential oil medicinal cabinet. Whether you use the oil as a topical application or add it to a diffuser to scent your home, you will find that it will make you feel great overall. If you want to treat inflammation or wish to look younger, you can achieve both goals by using this well-loved oil. The oil can be added to shower or bath products or your skincare lotions or creams. You can find a lot of ways to use this oil and will be well pleased with the results.